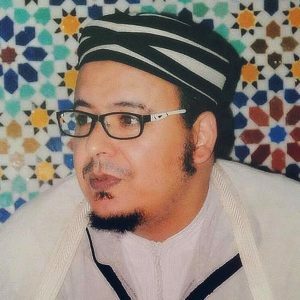 Umar Al-Qazabri a Moroccan Quran reciter and Imam. He was born in 1974 in Marrakesh. His father helped him memorize the Quran at the age of eleven. Soon after having got his baccalaureate, Omar flew to Saudi Arabia in order to learn more about Islamic Fiqh. He enrolled in Islamic Institute of Mecca in 1997. In parallel of his studies, he was leading prayers in Jeddah’s University mosque. Later on, he went to Egypt and worked with Sheikh Ahmed Al Ma`sarawi on a project entitled “The Ten recitations achievement”. Back to Morocco, Umar had gained a huge experience from masters of Quran recitation and Islamic sciences. Al-Qazabri first led prayers in Oulfa’s mosque (Casablanca, Morocco) and earned much popularity thanks to his recitation of the Quran. He then was nominated Imam and Reciter of the monumental Hassan II mosque. Sheikh `Umar is also known for his interesting conferences and speeches. He is nicknamed the Minbar nightingale.